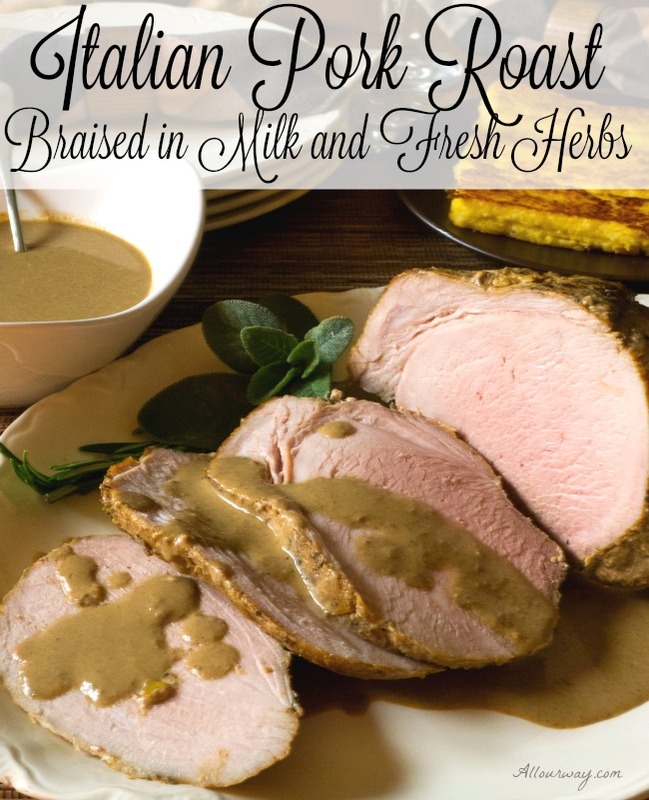 Italian Pork Roast Braised with Milk and Fresh Herbs is a recipe that takes simple ingredients and turns them into a down-right mouthwatering dish. Milk-braised pork is a regional favorite of Bologna, a city in the Emilia-Romagna region. Just think, all it takes is a chunk of pork, milk, wine, some herbs and you have a meal fit for royalty. And then, to tweak the recipe a bit, we decided to add dried porcini mushrooms. We love the earthy flavor the porcini gives a recipe. To help soak up the delicious gravy, we made a creamy lemony polenta. For this recipe, you will need pork roast, whole milk, heavy cream, porcini mushrooms, dry white wine, butter, olive oil, garlic, anchovy paste, red pepper flakes, lemons, rosemary, sage, polenta, buttermilk, chicken broth, Parmesan cheese. In central and northern Italy it is very common to braise meat or poultry in milk. Jaime Oliver has a very popular recipe — Chicken in Milk. I have yet to try his recipe but I know many bloggers who have and they say it’s superb! Normally a pork rib roast or a pork loin roast is used for this recipe. Since we had a Costco pork sirloin tip roast in the freezer, we decided to use it instead. Costco sells these pork roasts in a package of three and we find them very budget friendly and versatile. When the Italian pork roast cooks in milk, it becomes tender, and the milk turns into a delicious nutty-tasting sauce. Do you remember this is what happened with our Bolognese Sauce Antica? Meat cooked slowly in milk turns the meat incredibly tender. Adding heavy cream to the Italian pork roast as it cooks ensures that the sauce is smooth with no curds. The reconstituted dried porcini we decided to add, gives the dish an added sophistication. We browned our Italian pork roast in a deep iron skillet then transferred it to our slow-cooker. It only took the Italian pork roast an hour to cook to 145°F. Depending on the size and shape of a pork roast, it could take a little bit longer. It’s always wise to use an instant-read thermometer. 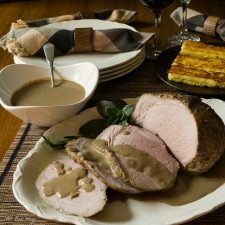 We transferred the Italian pork roast to a platter and then used our emersion blender right in the slow cooker to purée the sauce and mushrooms. We served our Italian pork roast with lemony polenta which complimented the rich dish perfectly. The polenta acts just like mashed potatoes soaking up the yummy milky sauce on the plate. Be sure to sign up for our newsletter so we can share with you what we’re cooking — lots of great recipes coming up. This is an ideal way to take an inexpensive roast and make it fit for a king or queen. The meat turns out flavorful and tender with a delicious creamy gravy that you can pour over the meat and lemony polenta. Pork roast is slowly braised in milk with fresh rosemary, sage and porcini mushrooms. The meat becomes tender and succulent while the milk turns into a delicious sauce that has a nutty like flavor. 2 sprigs each fresh rosemary and sage tied with kitchen string. Heat butter and oil in a large skillet over medium-high heat until butter melts. Add pork, fat side down, and sear until brown, 3-4 minutes. Brown pork on all sides, about 5 minutes more; transfer to a 4- to 6-qt. slow cooker. Add garlic to skillet; cook 30 seconds. 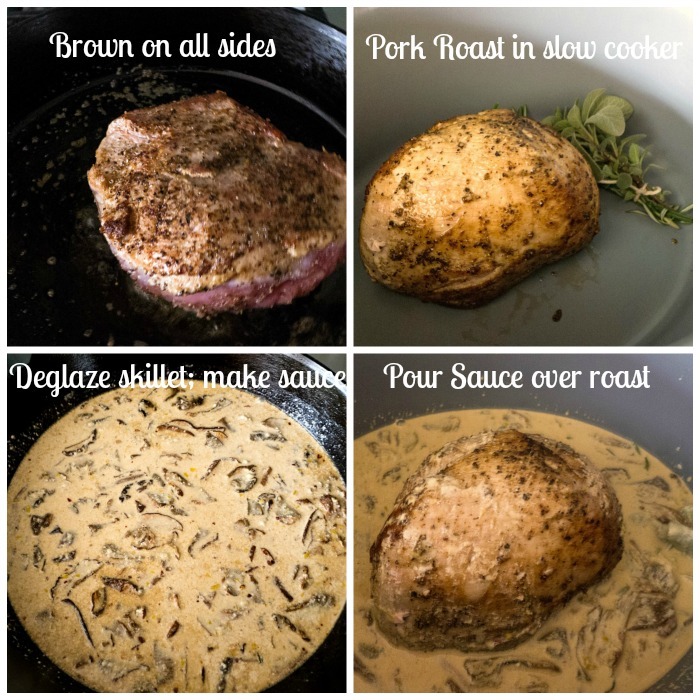 Deglaze skillet with wine, scraping up any brown bits. Add milk, cream, porcini, anchovy paste, pepper flakes, and zest; simmer 3 minutes. Pour milk mixture around pork in slow cooker; submerge rosemary and sage. Cover slow cooker and cook pork until an instant-read thermometer inserted into the thickest part register 145 degrees F on low setting, 2 hours. Transfer pork to a platter and tent with foil to keep warm. Discard rosemary and sage. Purée sauce in the slow cooker with a handheld blender until smooth; season with salt and black pepper. Slice pork and serve with sauce and Lemony Polenta. Whisk together the broth, buttermilk, and cornmeal in a saucepan and bring to a boil over medium heat. Reduce heat to low, and cook, whisking constantly, about 5 minutes; remove from heat. Stir in Parmesan, butter, and zest; season with salt and pepper. ** Save the porcini broth for later use by pouring the juice through a coffee filter to remove any impurities. We had leftover polenta that we sliced and browned in a heavy iron skillet with a little olive oil and butter. Adapted from Cuisine at Home February 2014 issue. This came out so juicy, tender and delicious! Looking forward to having it again soon! I’m so glad you enjoyed it, Justine!Hope you’re holiday season is going well. Its not only until recently that I started to experiment with mixing milk and various herbs. Their combination gives so much to pretty much any dish. So I can imagine how tasty and flavorful this pork roast is! Thank you for sharing this wonderful recipe! That is such a flavorful and delicious looking dish. SO perfect for the holidays — very festive and crowd pleasing. Thank you, sweet friend. I would simply love to trade recipes with you AND sample. Wishing you the very best Christmas and a very profitable New Year!! Abbracci!! The sauce looks so good. White wine, cream, and mushrooms….so much yum. My family adores this. That had to be a delicious meal and I can just imagine how tender the pork was. A classic Italian roast. Looks fabulous. Great photos Marisa. This has my mouth watering!!! That certainly looks tender and delicious. I’m sure those dried porcini added tons of flavor. I made that Jamie Oliver recipe and while the chicken was tender, the sauce was really curdled. An immersion blender helped to smooth it out. 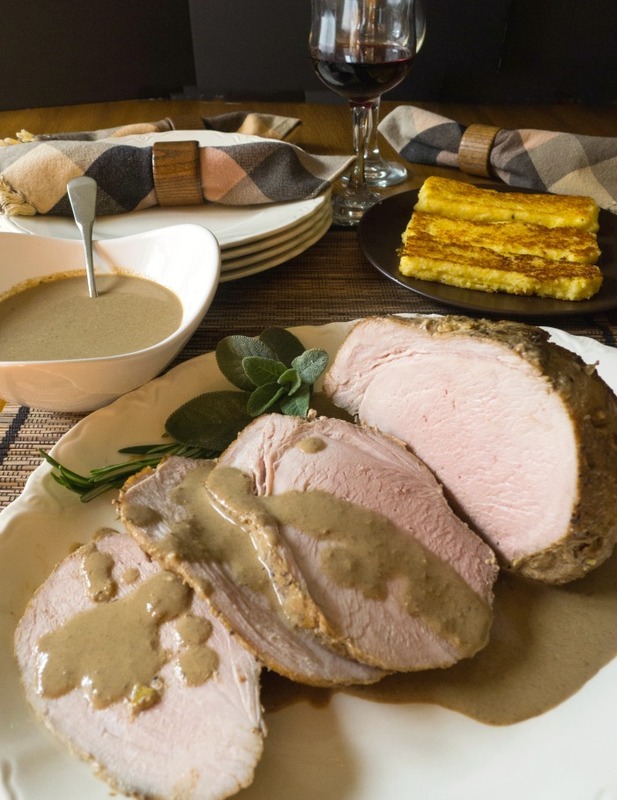 My mother used to make a pork roast in milk, and I always love that. I need to try it myself to bring back all those memories. Thank you, Linda! Our family memories are so precious!! We still have Sunday Dinners for my in laws who live with us and this would be the perfect meal for them. My father was a butcher and he loves a good roast….this looks delicious! Thank you, Denise! It really is a tasty roast and the gravy is wonderful. I love really good Italian regional food and will certainly be making this, especially with that huge pot of sauce. Bologna is such foodie city – this will take me back there. I have never cooked pork in milk ever before and ever considered the option either. I do chicken very often and have added cream in beef and lamb so yeah, why not pork right. Can’t wait to try this one Marisa. It looks divine. This sounds very interesting. I have not braised pork with milk. I have marinated chicken in buttermilk. What a great Sunday dinner this would be for the family. I think it would be a great dish to entertain with too. Your friends will always want an invention to eat at your house. Sauces and gravies are my weak suit, the texture on yours looks great. I haven’t tried making pork roast with buttermilk, it sounds intriguing. A great technique everyone must try. So simple and easy. Love how delicious this looks. I rarely ever make pork but this would be such a treat in our home. Saving this for later for sure. Its fantastic! YUM! This looks so delicious! Thanks for the recipe! I want to try it! I dont know what to make first this fabulous recipe or try to find that pompano so I can make your fish recipe since I love it! LOL you make everything we love and eat about the same way we want to cook it.! that gravy looks great a must try soon. First we need to catch pompano! This sounds absolutely delicious. I love that the meat is browned a bit first before cooking further and I think the anchovy paste is a brilliant idea to add flavor to this sauce. I’d love to try this! I have never heard of cooking meat in milk but now that you say that I can see how it would make meat so tender. I can’t wait to try this! Hello Frank! I have not cooked a lot with milk but I’m all gung ho on making chicken a la Jamie Oliver. I hear it is really good.Have you tried it?? Have a great week. This needs to go on my menu someday soon! I love pork and can imagine the deep rich flavor of that sauce! Delicioso! Hi Annie! I’ve got to admit it is lip smackin good. The pork turns out so tender — I don’t know why I didn’t use the milk method years ago. I’ve made this before, but never looked as good as yours. I must try again. I love how that milk cooks down almost to consistency of nut butter. Hi Angela! That sauce was soooo good!! It is a definite make again. Wow, what a fabulous meal you prepared. I grew up with a Northern Italian mother who used to make a similar roast in milk but haven’t made it myself. I need to do this — and make a double portion of that polenta. It all sounds divine. Thank you Linda. It was good and I’ve been wanting to make it for a long time. We were gone for quite a while and no slow cooker. Had to wait until we got home. Polenta is my weakness — along with pasta, risotto, farro, etc. Have a great week. Looks great, Marisa—I will have to try it. I’ve made Jaime Oliver’s recipe of chicken in milk, but never a pork roast. Now, you’ve given me another recipe to try!! Thank you Diane! I think you and the person who doesn’t like mushrooms will like the recipe. You don’t have to add them if you don’t want to but with the emersion blender you can’t “see” them 🙂 Have a great weekend. Milk braised pork is just amazing. A technique everyone should try, and the sauce you get as a result, delicious! Yours looks amazing, I’m now craving this. Oh man, that looks amazing. I almost never make pork roasts, but this has me wanting to change that now! Pinned, to try later! Hi Tracy! I think this pork roast will make you a pork fan! Let me know how you like it. Sounds loveley – especially the herbs in the sauce. And thanks for the step-by-step photos. Hi Kate! 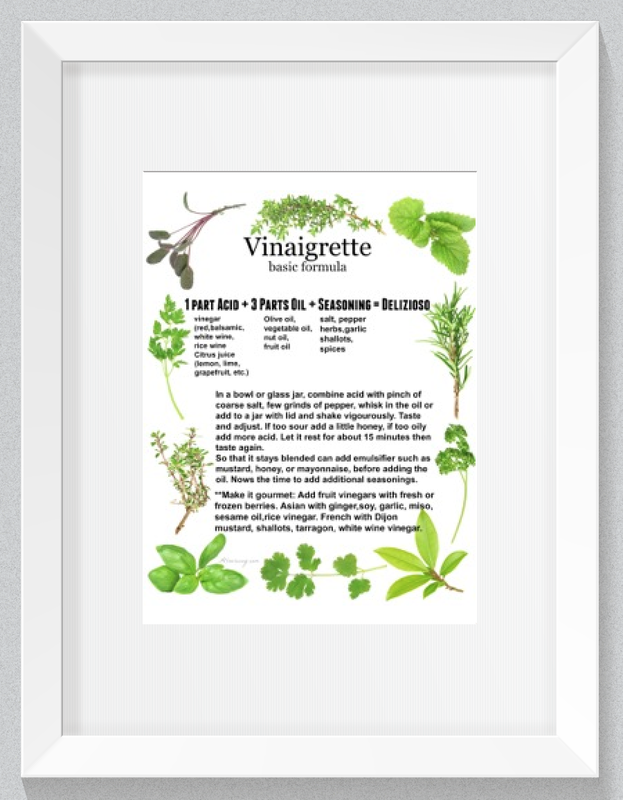 We do like our herbs and use the ones from our garden when they are growing. Have a great weekend. Hi Jo! Do try it, you and your family won’t be disappointed. Have a great weekend. Oh my, this sounds like it would be so successful in our house. I love Costco for meat – Such good value and good quality. Hi Helen! Costco does have good meat and that package of pork is a real bargain. We use the meat for roasts, stir fry, kebabs, etc.If you don’t like polenta (I can’t imagine anyone liking polenta :-() you can sub mashed potatoes. A real Italian classic method for cooking pork. Your recipe takes it to a delicious, new level. Love the additions to the pork and the sides. Looks like you had a great dinner. I guess you hare happy to be back in your kitchen. Have a wonderful weekend.